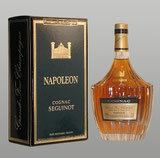 Spirit Journal founder and spirit tasting expert, Paul Pacult has recently tasted and reviewed our Seguinot Napoleon Grande Champagne Cognac and awarded it with his highest rating, five stars. His review appears in the September 2009 issue of the Spirit Journal, (http://www.spiritjournal.com/). Also reviewed in the September issue is the Seguinot V. S. O. P. Cognac which earned a “Highly Recommended” four star rating, as well as our Calvados Roger Groult’s 8 year old Pays d’Auge which also earned a “Highly Recommended” four stars. We are thrilled but not surprised at the news. The entire Heavenly Spirits portfolio has been carefully assembled for the unique qualities, and craftsmanship evident in each of the products we represent. It is indeed satisfying to have such an affirmative confirmation from someone as well regarded as Paul Pacult. The Spirit Journal, one of the industry’s most respected review forums, is published in print only, on a quarterly basis and it does not accept advertising. Check back to read the full reviews which we will be posting here on the site.